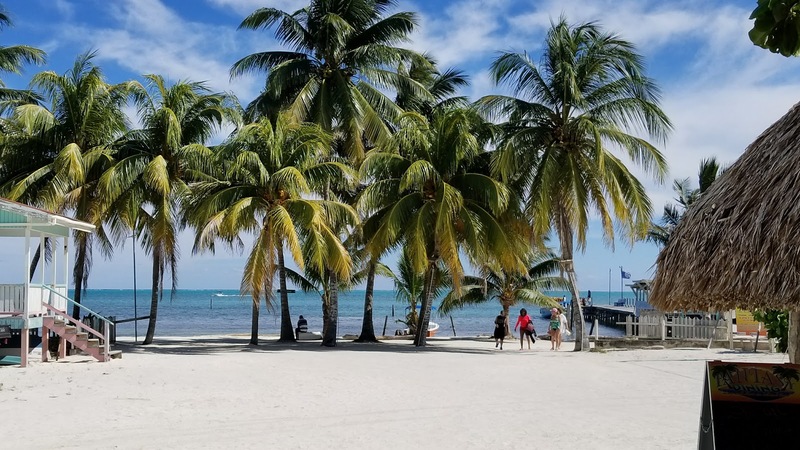 We ventured ashore to beautiful Belize today. In order to keep from disturbing the Belize Barrier Reef, cruise ships anchor out in the ocean rather than pulling in to port. This made the disembarking procedure a bit more involved than usual. We had to head to one of the lounges to wait to be dismissed for a ferry to take us to shore. We hadn't counted on having to wait for a ferry, so we were late for the excursion we had booked with discoverbelize.bz. Thankfully, our guide, Natalie, was still waiting for us when we arrived 30 minutes after our arranged time. 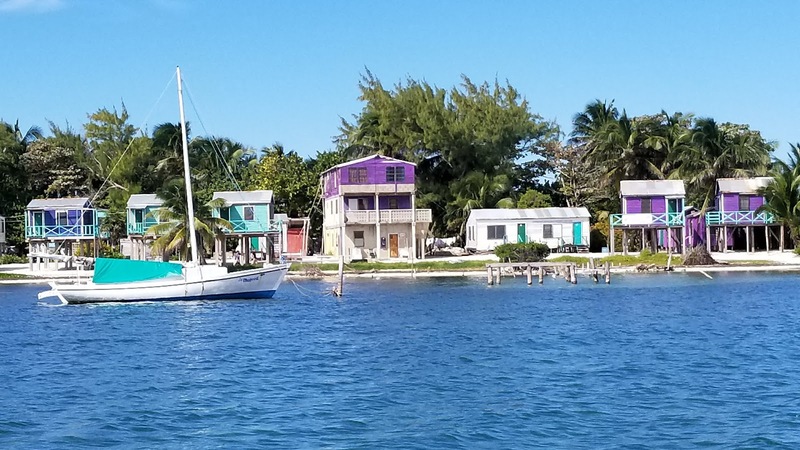 She walked us over to a pier where we got on another boat and jetted off to Caye Caulker, one of the small islands off of mainland Belize that make up the country. We pre-ordered lunch at Fantasy Dining and then hopped back onto the boat to do some snorkeling among the coral. This wasn't an "official" Carnival excursion. Carnival does offer a similar Shark and Ray snorkeling tour, but we had read that they pack people in shoulder to shoulder and hurry them along. 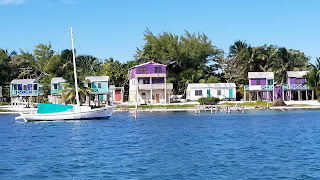 For just a little bit less than the Carnival price, we booked a private tour with discoverbelize.bz. We figured that our young children would handle things better if they didn't have to compete with the rabble for attention. Even though we had bought full face snorkel masks for our youngsters, we weren't sure how they would handle the experience. Thankfully, Natalie took charge and handled them. They loved every minute of it. We saw quite a few different species of fish, including some barracuda. 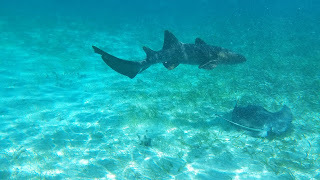 After a quick swim around the reef, we got back on the boat and headed out to Shark Ray Alley. The youngsters, having heard the word "shark" didn't want to get into the water. The rest of us jumped right in, though. 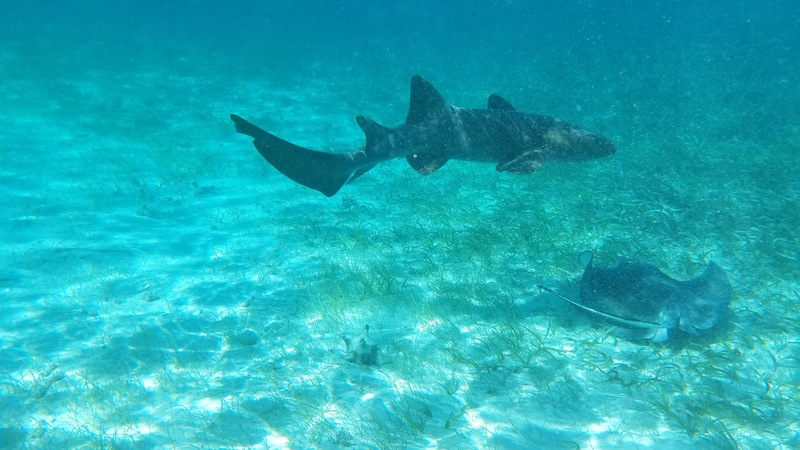 Thanks to my Samsung Galaxy S8+, I was able to take some underwater pictures of the nurse sharks and the rays that wait around for the various tour boats to chum the waters. I did have to breathe a sigh of relief whenever I saw a boat overpacked with other tourists pull up. I have to say it again: For less than the price of the Carnival endorsed excursion, we got a private tour. After having tons of fun among the sharks and the rays, we got back on the boat and went out to feed sardines to a group of tarpon. Tarpon are sport fish common to the area that grow to be about 6 feet long. They look a lot like herring. Each of us took a turn holding a sardine just above the surface of the water until a tarpon jumped out and took it from our hands. My daughter and her friend were suitably horrified at the prospect of holding a slimy fish while another, larger fish jumped out of the water to pluck it out of their hands. Myself, I didn't want to lose a finger, but I braved the encounter and wound up with all of my digits still intact. My boys thought the whole thing was hilarious. Our lunch at Fantasy Dining, just off the pier was much better than I had expected. Pressed for an answer to what I wanted, I ordered chicken nachos under duress. They were really good, but my son's order of fish and chips was so much better. My wife got the snapper which she said was really good and my daughter got her usual go-to dish of chicken fajitas which she seemed to enjoy. My oldest son got a hamburger as did my daughter's friend. As good as the food was, the view is what really made lunch a fantastic experience. Eating good food, looking out at the ocean behind the palm trees. This is the life. After lunch, we spent a little time on the beach where the boys collected sea shells and coral. To borrow a local expression, the whole day was un-BELIZE-able and we'd love to be able to do it all again.